Not Ready for Girl's Summer Camp Just Yet? 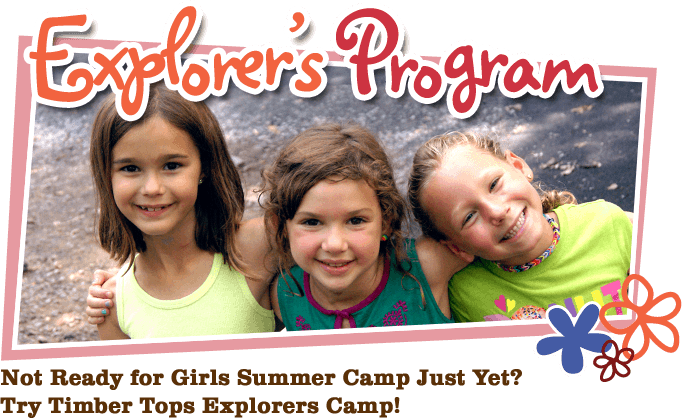 Try Timber tops Explorers Camp! Come up for the weekend for two fun-filled days and one night at camp! If your child is entering 1st, 2nd, 3rd, or 4th grade and is not yet ready for camp, we'd like to invite your prospective camper to share in an action-packed weekend at Camp Timber Tops! Girls will have the chance to participate in exciting camp activities with other prospective campers while camp is in session, the whole time being supervised by our excellent staff. While children are enjoying Explorer Camp, parents can tour Timber Tops and meet with the directors. Weekend activities include athletics, swimming, arts & crafts, outdoor adventure and more! Transportation available to and from the Philadelphia area and the New York City area for our Explorer Overnights. *Play Days are our version of Explorers in one action-packed, 10AM-4PM, day! Parents are invited to tour camp and meet with the directors, then they're encouraged to go out to lunch and explore the area while future campers enjoy camp for the day! *We will provide bedding for our Explorers! 11:00am Welcome Explorer campers and a tour of Camp Timber Tops. 12:30pm Healthy Lunch; could be grilled cheese, hamburgers and hot dogs, always paired with delicious salad choices. 1:00pm Explorers join our youngest bunks for supervised play both inside a real cabin and outside group games. 2:30pm Get Ready an afternoon at Lake Selma! Boating, sailing and jumping off the inflatables! 4:30pm Choice Activity. What do you love to do? Join our incredible staff to learn gymnastics, cooking, nature, model rocketry, yoga, and more! 6pm Dinner; What's on the menu tonight? Baked chicken, tacos, Chinese food, something healthy and appetizing offer each night paired with your choice of delicious sides. 6:30pm Line up! Hear about awesome evening activities, listen to the news of the day and lower the flag. 6:45pm Arts and Crafts; make a pillow or a candle to bring home. 7:30pm Evening activities; join in with our Junior campers and counselors for unique night time fun. 8:30pm Campfire with s'mores, songs and stories. 8:20am Breakfast with bagels, eggs, fruit and cereal. 9:30–11:30am Lower and upper rope elements at our Adventure Course. 11:15am Group picture at the Dining Hall steps. 11:30pm Lunch with the whole family. 10:00am Welcome Play Day campers and a tour of Camp Timber Tops for parents. Campers participate in activities such as boating, arts and crafts, ropes and gymnastics. 11:00am Head to Gymnastics for some fun on the Tumble Track! 11:45am Stop off at Cooking to whip up a sweet treat to enjoy after lunch! 1:00pm Explorers join our youngest bunks for supervised play both inside a real cabin. 1:45pm Off the adventure course to go off our mini zip line! 2:30pm Get ready to head to the Lake for boating and some play on the Wibit. Who knows, maybe s’mores will follow! 3:15pm Stop by our Arts & Crafts village for a Camp Art Project! 4:00pm Parents return to camp to pick up campers. We hope to see you next summer! !